Bathroom Remodeling | Brooks Plumbing Co. Along with your toilet and shower or bathtub, the bathroom sink is the most important factor to consider during a bathroom remodeling process. It’s one of the cornerstones of the space, and a spot where you’ll be spending more time at than almost anywhere else in your house. Accordingly, you want your new sink to match the aesthetic deigns of the new bathroom, but also follow some practical considerations. All of the style in the world won’t help you if you need to use the sink day in and day out, and here in Olympia, WA you need to look at the long-term functionality of your sink. Here are 3 basic types of model for you to consider, that can help with that issue. The bathrooms in a home are not the centers of social and family life, but they are central to daily life: the first place you go after your wake up in the morning, the last place you go before heading to bed. Bathrooms are also the spot where you use the most water in your home. A bathroom that is becoming old and outdated can turn into a sore spot in your day and a locations where you waste water and suffer repair problems due to declining plumbing. Arranging for bathroom remodeling can change all this. Remodeling a bathroom is about more than giving the place a quick face-lift; there are a number of advantages that you may not have thought about. Call Brooks Plumbing today and ask about our bathroom remodeling services (as well as our kitchen remodeling) and we’ll explain what we can do for you to enhance this important room in your home. Conserve water: For a bathroom remodel, you can choose to have old, wasteful water fixtures replaced with EPA-approved low-flow models. Low-flow faucets and toilets use 30% less water than standard models (and sometimes even less, if you are replacing a very old toilet) without sacrificing performance. Depending on your water use, this can add up to a few hundred dollars in savings from your utility bills each year, and you will help the environment as well. Get rid of poor quality or aging pipes: A remodel is an ideal time to have the old plumbing in your home taken out and replaced with newer material like copper and PEX. If your plumbing has experienced numerous leaks and clogs in the bathroom, it’s probably past time you had the aging plumbing modernized. Increase your home’s value: Any effective remodeling job will increase your home’s resale value because it will be more modern, attractive, and efficient. Brighten the room: Finally, a remodeled bathroom will simply be a more pleasant place. With new a tub and fresh fixtures, a bathroom will change from drab and functional to a cheerful spot. You spend a great deal of time in the room: why not make it brighter and more life-enhancing? Although some homeowners like to take on home remodeling as a DIY project, you do not want to do this for a bathroom: the plumbing work is simply too important to risk on amateur work that creates leaks. Contact our Olympia, WA bathroom remodeling specialists today, whether you want to get started right away with the project or if you just need more information on how our remodeling works and what it can do for you. The bathroom isn’t like the living room, kitchen, dining room, or even bedrooms: it’s a room that functions independently from the social areas of your house. But that doesn’t mean you should neglect it when it comes to remodeling. As the first room to greet you in the morning and the last one to see you before you go to bed, a bathroom that feels tired and drab will likewise make you feel tired and drab. There is a dazzling variety of sinks available for an upgrade. If you have a standard drop-in or under-mount sink built into a cabinet, you can completely change the appearance a feel of your bathroom with a different design, such as a wall mount or corner mount sink, pedestal sink, or the popular and eye-catching vessel sink. Each of these sink designs have advantages and disadvantages: some allow for greater space in the bathroom, but lack storage. Balance out the various factors of appearance, storage, and space to find a new sink that will bring the right touch to upgrade the look of your bathroom. If you are concerned with water conservation and saving money on your bills, consider having a plumber install low-flow fixtures, such as a low-flow toilet, faucets, and/or showerheads in your bathroom. 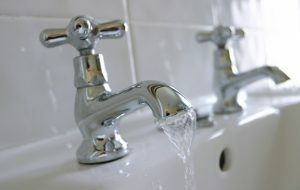 EPA-approved WaterSense low-flow faucets can reduce water flow by 30% or more without a noticeable drop in performance. Because of the enormous amount of water used in a master bathroom, reducing water use here even by a third will result in a large reduction in your water bills. If you save 700 gallons of water a year (the average for a family using EPA-approved faucets), that’s the equivalent of 40 showers. You’ll also save energy, since your water heater will need to run less. Here’s an excellent way to upgrade the appearance of your bathroom and upgrade your comfort and relaxation as well. Since the tub is the largest item inside a bathroom, replacing it with an attractive new model will give the room the sense of a full remodeling. You can also choose from bathtubs equipped with luxury features like water sets and contoured interiors. Brooks Plumbing handles full bathroom remodeling in Olympia, WA, but we can also assist you with making smaller touches like the ones above to enhance your bathroom a few fixtures at a time. We have an excellent selection of tubs, toilets, and other fixtures to choose from so you can have the look you want to make your bathroom more attractive and functional. Our plumbers and remodelers have the years of experience necessary to make sure you end up with the bathroom upgrades you dreamed of. Remodeling a bathroom involves different stages and tasks, from the more mundane jobs of removing old fixtures and attaching the plumbing connections for the new ones, to the exciting design choices for new floor material and sink and shower types. There’s one part of a remodeling job that isn’t mandatory, but which we highly recommend you integrate into you Olympia, WA bathroom remodel when you schedule it: full plumbing replacement. Does this sound like an unnecessary hassle in an already large-scale job? It isn’t as time-consuming or difficult as you imagine, especially with expert plumbers and bathroom remodeling specialists like the team at Brooks Plumbing handling it. And there are some very good reasons to decide to make pipe replacement one of the essential steps. Keep in mind the age of the plumbing in your home. If you are at the point where you need to have a bathroom remodeled, it’s probably because you have an older house that needs upgrades. For a home older than 1970, the pipe material is likely aged and in need of replacement. Homes built before 1970 often used galvanized steel pipes instead of copper, CPVC, or PEX pipes. Galvanized steel is durable, but also prone to corrosion over time, and you should have it replaced at any opportunity you can. Since a remodel in your bathroom will expose the pipes, it is much easier and less time-consuming to have the replacements done as part of remodeling. Another reason to replace plumbing is that it frees up the design process for the remodel. If the remodelers have to work around existing pipes, it limits their options for rearranging the bathroom and putting fixtures in different locations. If the remodelers can change out the plumbing entirely, it opens up the process to more extensive re-design concepts. The bathroom remodeling team at Brooks Plumbing will work with you from the earliest planning stages of your remodel all the way to the finishing touches. You can also call us to talk about the basics of having a bathroom remodel in Olympia, WA to get you started with your project. Whatever you need to create the new bathroom your home needs, you can rely on the professional and experienced staff at Brooks Plumbing. And if you are planning on replacing the plumbing are part of the remodel, keep us in mind, because we have years of work performing whole-house repiping jobs. The most noticeable feature in your bathroom is the bathtub. But how often is a tub worth noticing? Not often. When you decide to have a remodeling done on your bathroom, you should make installing a new tub one of your priorities. No other change will do as much for turning a bathroom into a revitalized space than a modern or retro-stylized tub. You have a large variety of tub types from which to choose when you have bathroom remodeling in Olympia, WA. They range from tubs with special high-technology features to designs that purposely recall previous centuries. When you work with Brooks Plumbing on your remodel, you’ll have your choice to craft the look and feel you want for your new bathroom. Recessed tubs: Also known as “alcove” tubs, this fixture contacts the walls on three sides, fitting fully into a niche. These are the most common types of tubs, often seen in modern home construction. They work well as showers and can fit ideally with sliding glass doors. They are affordable and “no frills,” so they will work if you are going for a simple bathroom design. Corner tubs: Similar to recessed tubs, except they attach into a corner with only two sides abutting the walls. Although often smaller than other tubs, they do help save space in a bathroom. Freestanding: This is the “classic” tub style, what people think of when they imagine the bathrooms of yesteryear. But they still work today, especially with the freedom of placement they offer and the simplicity of installation. They also come in a variety of styles that will fit almost any décor. And haven’t you always wanted the elegance of a claw-foot bathtub? Platform: These tubs are dropped into a platform or else sunk straight into the floor, much the way that drop-in sinks work. This makes them perhaps the most versatile of bathtubs when it comes to design, since they will fit in with almost any platform or floor look. However, they require more installation work and planning than other types of bathtubs, and may also cost more. Your tub selection continues beyond choosing a type. You have variety of materials you can choose to fit your design as well as for function and ease of care. Your professional remodeler can help you navigate the multitude of choices. You will also have options for features such as whirlpool and massage tubs, plus numerous kinds of faucet designs. Call Brooks Plumbing today to discuss how we can handle your bathroom remodeling in Olympia, WA. Finding the right bathtub to enhance a bathroom is only a part of our comprehensive services for remodeling. We often give little thought to how much use our bathroom receives through the day. But after you have a full remodel done, you’ll understand how central it is—and how much better it is thanks to the work of professional remodelers. A complete bathroom remodeling job is an excellent way to enhance your life. A bathroom remodel doesn’t have to occur just on the surface, with new cabinets, faucets, wallpapers, and window frames. With the right plumbers working on the remodel, you can re-vamp the basic way that the room functions so you’ll have fewer future repairs and lower water bills. Here are 3 basic ideas for remodeling your bathroom that you might overlook. Our specialists in bathroom remodeling in Olympia, WA at Brooks Plumbing can help you with these upgrades and many more. Contact us today to start designing your ideal new bathroom. Replace your pipes: During a bathroom remodel, the construction work exposes most of the plumbing. This provides an excellent opportunity to replace aging or outdated pipes, such as galvanized steel pipes that may have started to corrode. The remodelers can also put in flexible and easy-flow plastic CPVC piping, which will permit more creative re-design concepts that won’t have to work around fixed rigid pipes. Install a low-flow toilet: Standard toilets consume a large amount of water with each flush. Your standard toilet probably uses between 4 to 7 gallons of water each time you pull the handle. But if you have a low-flow toilet put in during a remodel, you can reduce water waste a tremendous amount: current low-flow models consume around 1.6 gallons of water per flush. Factored over a year, or even a month, that translates into enormous savings in water use. Upgrade your tub: The largest new installation you can make in a bathroom is a new bathtub/shower, so you’ll feel tempted to leave your current one in. But this is a good chance to upgrade both the look of your bathroom and the quality of your time in the tub. Contoured tubs, whirlpool tubs, water jet tubs, or even a retro-free standing tub are all possibilities for your remodel that may fit your vision for a new bathroom. Brooks Plumbing offers full-service bathroom remodeling in Olympia, WA. We can handle all the plumbing and repiping you need, and install any new fixture you desire. To help guide you, we offer a wide range of fixtures from which to choose, and our staff of experts will help you select the furnishings that will work best together. We can make your remodeling move smoothly and quickly toward a final product that will meet or even exceed your expectations.